Ive written before about my love of free food. Foraging is just about my most favouite thing to do, especilly mushrooming. So with some pretty wet weather behind us, quite a few sunny days and a few bloggy reports on fungi sightings we thought it may be a good time to go 'shrooming. We packed the bean and ourselves into the mobile unit and headed out to the old Gold dggings site at Jupiter Creek in Euchunga in the Adelaide Hills. We know that leaf litter is a favoured spot for fungi growth and had had read online that its not just under pines where they are found here, but Eucalyptus leaf litter too (Funghi of the Adelaide Hills book duly ordered. After trapsing through some beautiful bush we came across a man on his horse, but no fungi to be found anywhere. A week too early?? So we loaded back into the car and headed to another spot where we had found field mushrooms last year. Nothing. Yup, too early. We saw one gathering of fairy toadstools (the classic red with white spot) but nothing edible and non halucinagenic! On our way back to the car we came upon a whole bank of spiky pods mounded beside the sloping path. Not something we see much of at all here, least of all when youre out mushrooming! We parked the boy safely and got to work, gently squeezing nuts out of their urchin homes with our shoed feet and collecting over half a kilo. 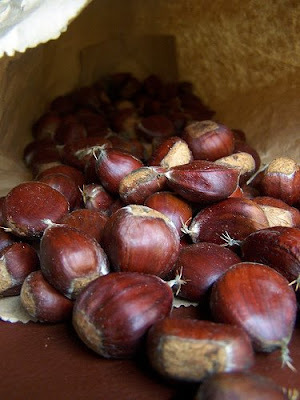 We enjoyed roasted chestnuts after dinner, squishing their floury sweetness from their skins. Its amazing what you can find out there to eat when you start looking. 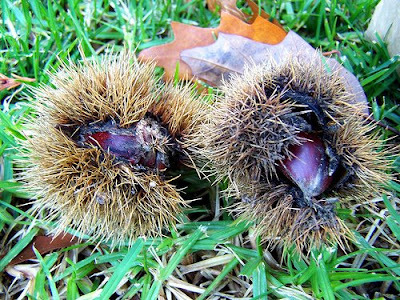 Oh I so love chestnuts when it is cold. It reminds me of Spain, where traditionaly 'old ladies' have these old metal cilindric 'bbqs' and roast chestnuts and sweet potatoes. They taste so good when one is out shopping, partying, and holding the paper cone (out of newspaper)is such a nice warm feeling! What a great find! I've started looking foraging for food more when out and about - although I found nothing for the first few weeks - i'm starting to find more and more now that I know what to look for. I'd still starve if I couldn't shop or garden! annuska- Quentin from Nirvana Biodynamic farm does chestnuts in the Stirling main st in winter on the weekends. Roasts them in the turned barrel and sell them in paper cones... not quite Barcelona! LOL but yum, roast sweet potatoes as street food - whoohoo! Tricia- yes its definitely mainly for fun factor in our household!